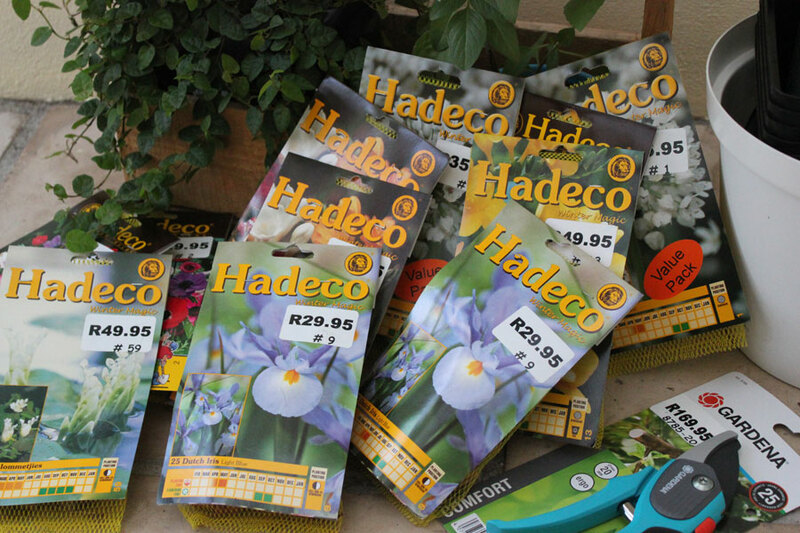 Hi Barbie – Thanks for taking me to Cape Garden Centre Nursery today – I won’t say too much about our visit because I know you want to do a review, but I thought I’d show my “stash” of newly purchased winter bulbs. I am thrilled with my purchases although I was a bit dissapointed with the lack of accessoiries available at the nursery. I was expecting to be able to get some bulb trays (for planting – to protect the bulbs from moles which I had plenty of last winter) and there was no special Hadeco bulb fertiliser or the usual accessoiries that Hadeco sell (bulb planter, dibber etc). Also dissapointing that there were no Tulips of Hyacinths available – I’ll have to try Ferndale Nurseries for those. I was very happy to find a pack of Waterblommetjies – aponogeton distachyos (Water Hawthorn – a perennial water plant with edible white flowers which need to be planted at a depth of 10 to 60cm under water). I also bought lots of my all time favourites, Dutch Irises as well as a few Alliums and lots of Freesias and Anemones. Its still a bit too warm to plant them now but that gives me time to carefully plan where I want to plant them and to prepare the soil before I do. So glad that we had time together to visit the Cape Gardening Centre. I was so ready with a full wallet but only left with two plants – that’s a first. But al least I am closer to getting an idea of what I want to do with my front garden. Thanks for the day and I’m glad you are happy with your purchases. Enjoy your weekend.